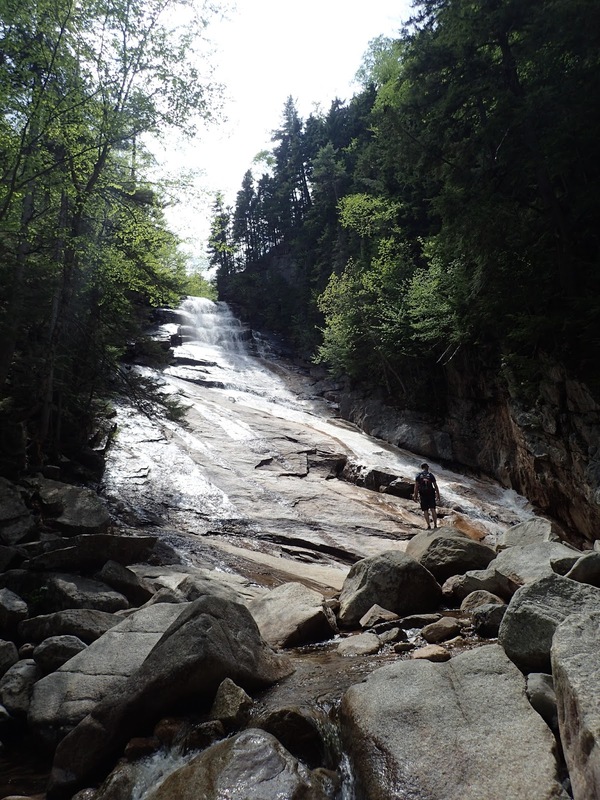 Ripley Falls, Crawford Notch State Park. One of my goals on a recent trip to Vermont and New Hampshire was to practice going with the flow. Though I've mellowed in my old age, I'm still a creature of habit, and when things don't go as planned, I'm typically more thrown than I'd like to be. But practice makes perfect, right? Going with the flow led my partner in crime and up to the top of beautiful Mt. Mansfield on our first full day in Vermont, and we set off for Lincoln, New Hampshire as soon as we finished. We stopped for an amazing dinner and Heady Topper at Positive Pie 2, and checked into Parker's Motel. After breakfast the following morning at Cascade Coffeehouse and Cafe, we took a look at maps and my hiking guide to plan the day's adventure. Truth: the elevation gain on our Mt. Mansfield hike, battle with bugs, and 80-85ºF temperatures took more out of us than we expected. My calves and knees were stiff and sore, I was a little sunburned, and it was clear I needed to drink more water (as per usual). Our goal for our second day of hiking was to find something more mellow. Turns out, we're not so good with mellow, even when we try. We ended up hiking 8.3 miles, gaining 2,500 vertical feet, and spending over five hours wandering around in the woods in search of big cliffs and waterfalls. Take a look at our entire route here. The White Mountains are, at the risk of stating the obvious, full of options. 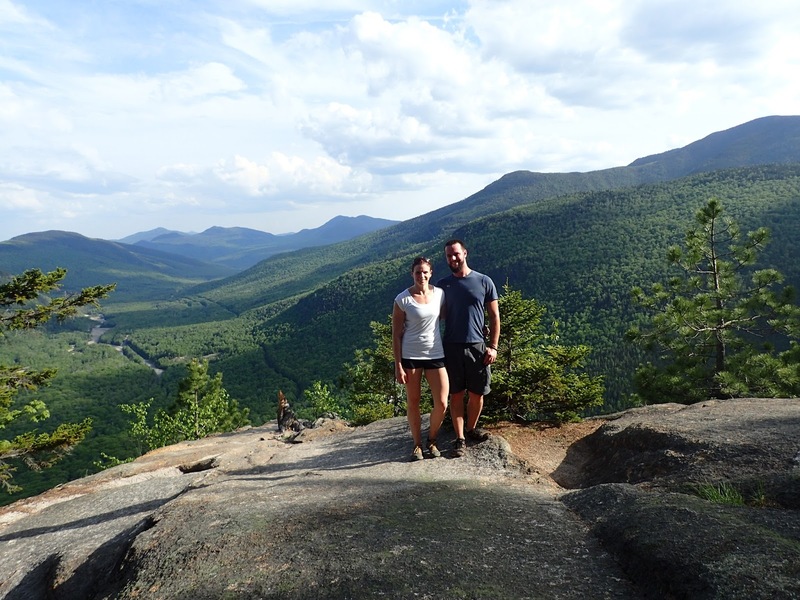 Hikers can travel on flat ground, climb mountains, find waterfalls, walk above treeline, and take a look at some pretty incredible geologic features. 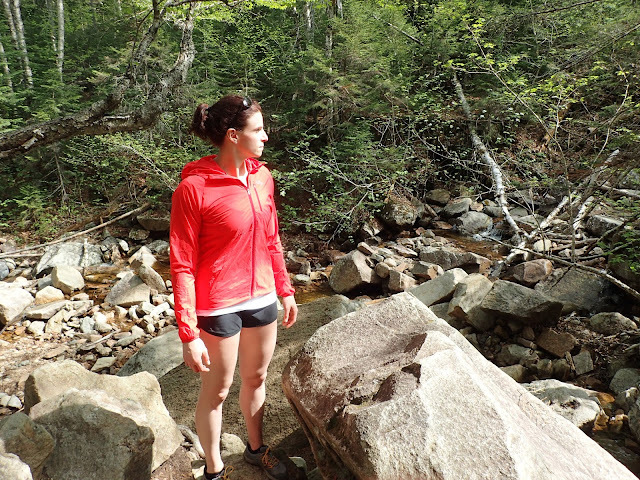 I love hiking to waterfalls, and we found a lollipop loop close to our hotel that took us the two highest waterfalls in New Hampshire. It seemed like the perfect option for our "mellow" day. It also kept us below treeline and out of the way of thunderstorms we'd heard might be passing through the area mid-afternoon. 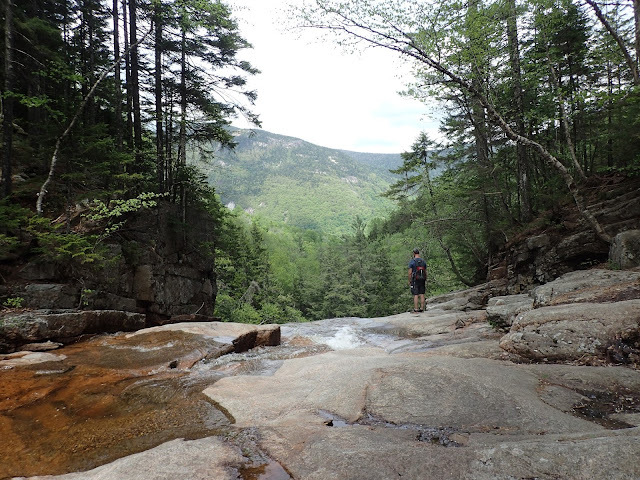 Ripley Falls, where Avalanche Brook flows 100' down over smooth, sloping granite, is accessible via the Ethan Pond Trail and Ripley Falls Trail. It's only a 1/2 mile hike in, making it an easily reachable and popular family hiking spot. Beautiful 200' Arethusa Falls is as accessible via a 0.8 mile hike in from it's own giant trailhead parking lot off Route 302, ½ mile south of Dry River Campground, or via the loop we chose. It's also an extremely popular family destination because the trail in, though steep at points, is wide and easy to follow. Climbing up the Arethusa Ripley Falls trail past Ripley Falls. The trail was beautiful! 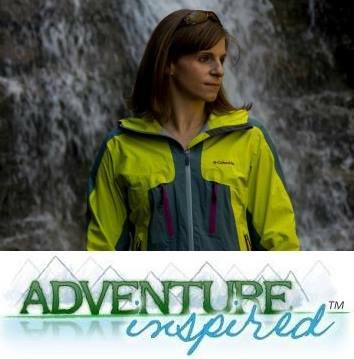 Visiting Frankenstein Cliffs requires either starting from the Ethan Pond Trail, as we did, or via the Arethusa Falls trail and parking lot. We chose the loop because we wanted to visit all three destinations in one hike, but it's absolutely possible to see one or more of them with less than eight miles of travel. After grabbing a giant cup of iced coffee and breakfast Cascade Coffeehouse and Cafe, we drove up from Lincoln to Crawford Notch State Park. Our destination was a small parking lot at the end of Willey Station Road off Route 302. At the end of the parking lot, which was full, we crossed a set of railroad tracks and started up the Ethan Pond trail, which later branched off south into the Arethusa Ripley Falls trail. About 15 minutes into the hike, we reached Ripley Falls. It was an incredible destination with little effort required, and after a few minutes exploring the falls, we crossed Avalanche Brook, continuing to make our way up toward Arethusa Falls. The trail was significantly narrower, steeper, and less traveled than the other trails we'd been on over the course of the trip, which was a welcomed change. But it didn't last long. Standing at the top of Ripley Falls, looking down from whence we came. After 1.5 miles, the blue blazed Arethusa Ripley Falls trail flattened out and brought us to an intersection. We had a choice to make - turn right and complete the loop counterclockwise, visiting Arethusa Falls before Frankenstein Cliffs, or complete the loop the opposite way. Counterclockwise seemed like the better option; given how steep the Frankenstein Cliffs trail is, we decided it would be better to tackle it going uphill rather than try to manage it going downhill. The closer we got to Arethusa Falls, the more crowded the trail got, which we expected. We saw families with young children, teenagers in flip flops, well-prepared hikers, and everything in between. Though I wasn't stoked to see people without proper footwear on the trail, I'm always happy to see kids learning to love the outdoors! Hanging out at the base of the falls, staring at the crowds! Many visitors hike up the 0.8 mile Arethusa Falls trail from it's own trailhead parking lot, and the falls were packed by the time we arrived. The fact that it's the highest waterfall in New Hampshire along with the ease of accessibility and the fact that it was a holiday weekend made it obvious why it was so crowded. 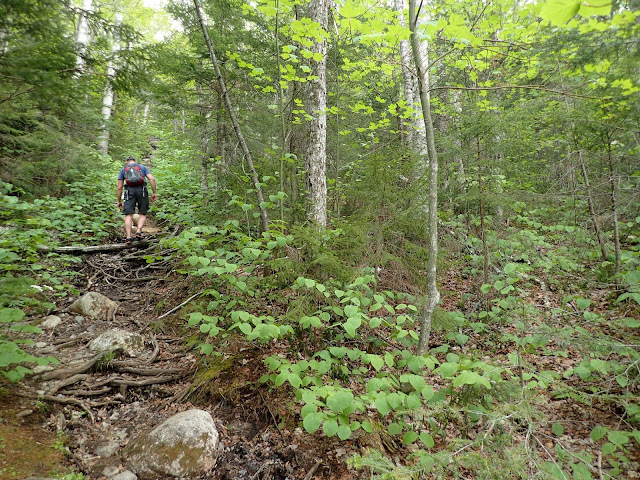 But unlike other crowded trails I've been on closer to home, I didn't see a single discarded water bottle or wrapper; good job, New Hampshire hikers! We didn't spend much time at the falls and opted to join the late afternoon crowd heading down from the falls. But unlike the majority of folks we ran into, we didn't stop at the parking lot, and instead crossed it in search of the yellow blazed Frankenstein Cliffs trail. A particularly steep section of the Frankenstein Cliffs trail. Glad we opted to climb up this way instead of doing the loop in the opposite direction! This 2.1 mile section of the hike traversed the base of the cliffs, passed under the Frankenstein Trestle, used by the Conway Scenic Railroad, and started climbing...steeply. The trail switchbacks up loose dirt and rock, and at times, required hand over hand climbing. The switchbacks were a welcomed change from the straight-up-the-mountain route we'd taken on Mt. Mansfield the previous day, and it was worth every bit of effort to see the view from the top of the cliffs. 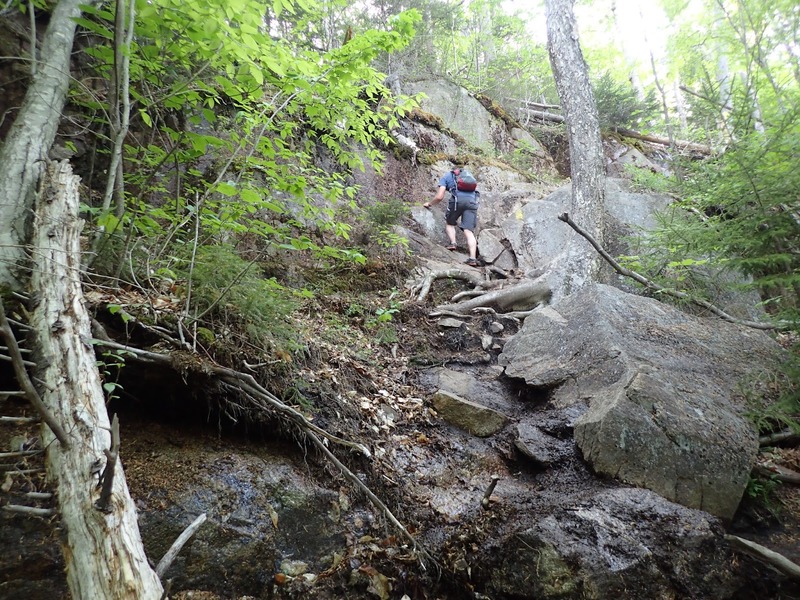 After a short break, we continued along the Frankenstein Cliffs trail to the intersection with the Arethusa Ripley Falls trail we'd come to earlier in the day. We turned right and continued back down to Ripley Falls, arriving back at the parking lot after a little over five hours of hiking (including breaks). All smiles at the top of Frankenstein Cliffs, post summit beers! Overall, the 2,500 feet of elevation gain wasn't as mellow of a day as we'd hoped, but it was a beautiful hike. If you're in the area with a day to spare, it's an easy way to see three of New Hampshire's most iconic spots in a long afternoon. Just be prepared for crowds! If you've visited any of these spots, how'd you get there? Did you do the same loop, or a different route? Have you done it in the winter? We'd love to hear from you!